I missed out on Capcom’s Dragon’s Dogma when it first released in 2012. The reception was positive, if somewhat mixed. The Kotaku review noted that it was a game with potential that fell short. Since then, it’s developed a cult following thanks to intense monster slaying and a large open world. The upcoming Switch port for its enhanced version, Dragon’s Dogma: Dark Arisen, is fantastic, and after pouring nearly 20 hours into it this weekend, I’ve yet to get bored. In Dragon’s Dogma, you’re a dumb schmuck fisherman whose heart is ripped out by a dragon. You survive as the Arisen, a chosen hero destined to slay the beast. What follows is an ambling adventure through a hostile open world packed with chimera, ogres, and other massive creatures. Each new battle is a chance to test your mettle and experiment with an intricate job system that offers numerous ways to tackle challenges. It’s a bit janky, but God if it isn’t fantastic fun. Whether you’re using holy magic spells to zap a necromancer or smashing a golem’s gems to methodically down it, every single encounter in Dragon’s Dogma is amazing. Combat splits the difference between Dark Souls and Monster Hunter. Striking a large enemy’s weak point yields dramatic results: The best way to fight a griffin is to climb on its back and shred the wings to ground it. You can stop a chimera from casting magic if you kills its goat head first. For every moment you spend exploring the world, there’s a boss monster lurking in the woods or ready to swoop out of the sky. Skyrim’s dragon attacks were neat, but I could kill those with a few well- placed arrow shots. 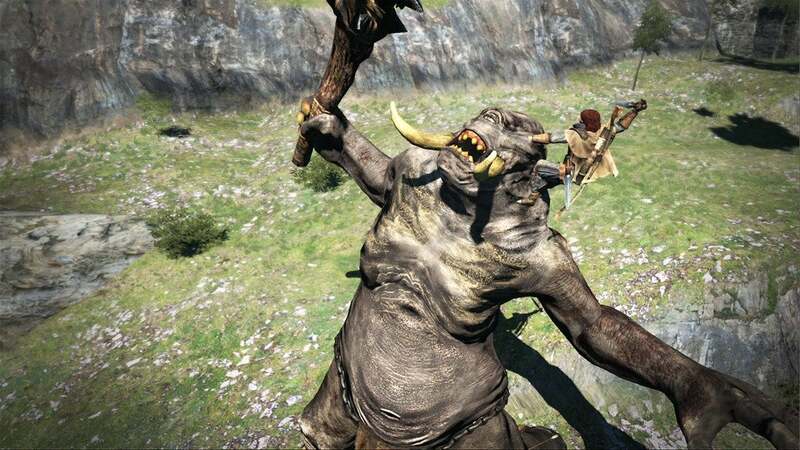 Dragon’s Dogma’s monster fights are hard, consistently intense work. The moment Dragon’s Dogma “clicked” for me was when I was playing as a Mystic Knight, one of the game’s advanced jobs. They can imbue their swords and shields with magical energy. I had been imbuing mine with fire magic so that anyone striking it would take damage. When a bandit rushed me, I raised my shield for a perfect parry. The bandit flew into the air and was burned to a crisp by a fireball that blasted from my shield. The world of Dragon’s Dogma is generic fantasy, no more unique than Skryrim, but combat keeps things fresh with a variety of jobs that have unique skills and strengths. A broadsword-using warrior can uppercut enemies into the air; a powerful enough sorcerer can summon a massive dark-energy tornado that lifts goblins into the air and drops them to the ground with a splat. You’re also able to summon AI companions called Pawns. These assistants, the majority of which are player creations, learn from their experiences. After fighting undead, for instance, they’ll be wise to the fact that zombies are weak to fire magic. If I have a Mage Pawn, they’ll buff my party with holy magic when facing necromancers or dark beasts, allowing my Ranger pal to let loose with blessed arrows. They’re prone to some mindless risk taking from time to time, but it beats going it alone. Even better, your created Pawn earns rewards when summoned by other players. I’m playing before launch, so that only happens from time to time, but it’s still helped in many cases. It feels good to know that you’ve helped someone else, even indirectly. The port functions well, too. Whether handheld or docked, it runs well and is easy to control. Unlike Dark Souls Remastered, which is a good port that is hard to play handheld, I’ve always felt like a capable player with Dragon’s Dogma, regardless of the mode I’m in. The graphics aren’t perfect—everything’s a bit brighter for some reason—but it runs well. This is the Dark Arisen version, which adds all of the preexisting expansion and downloadable content, including a difficult multilayered dungeon that feels plucked straight out of Dark Souls. It’s as complete a Dragon’s Dogma package as you’ll find. I was aware of the cult following Dragon’s Dogma had amassed, but I’d never poured much time into it myself. That was a huge mistake. This is a deep RPG where your job class matters and where each new trip through the world results in epic battles. There are aspects that can feel repetitive, and the main story isn’t anything to write home about, but I’m hard-pressed to think of the last time I got this excited about exploring an open world. Fans looking for an excuse to replay Dragon’s Dogma should be pleased, and if you’re a newbie like me, you’ll find an RPG to sink countless hours into it when it releases on 23 April.